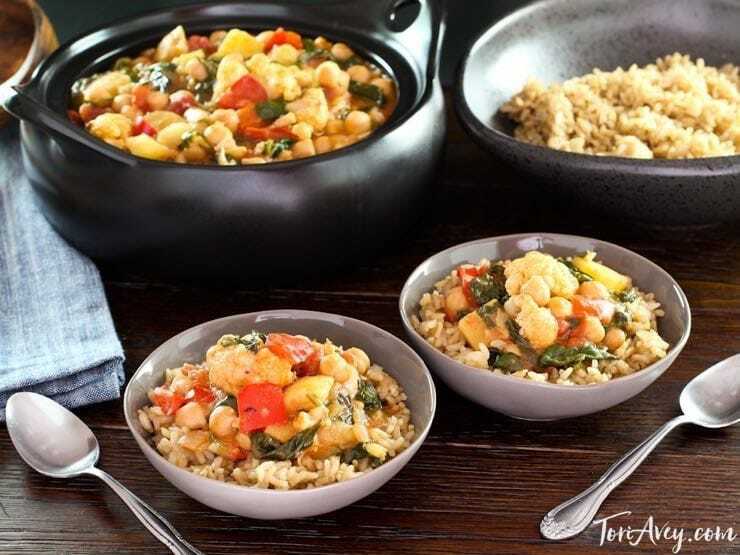 This warming, healthy and delicious Curried Vegetable Stew is the ultimate clean, nourishing meal. 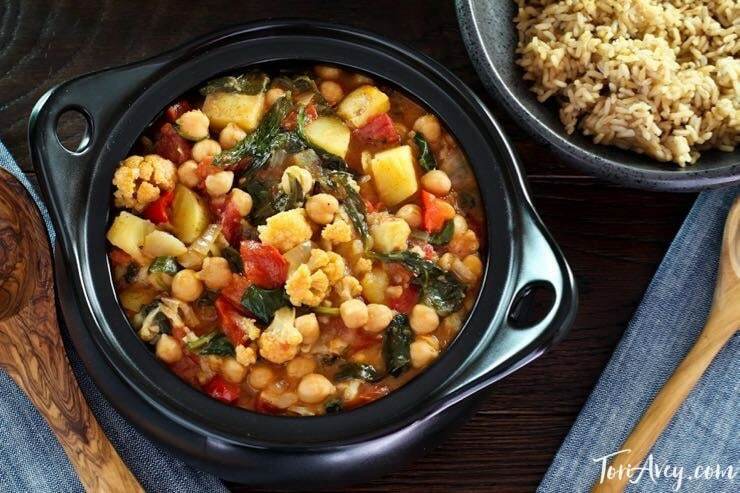 It’s a vegan, gluten free one-pot meal with cauliflower, chickpeas and greens in a creamy curry-flavored coconut sauce. 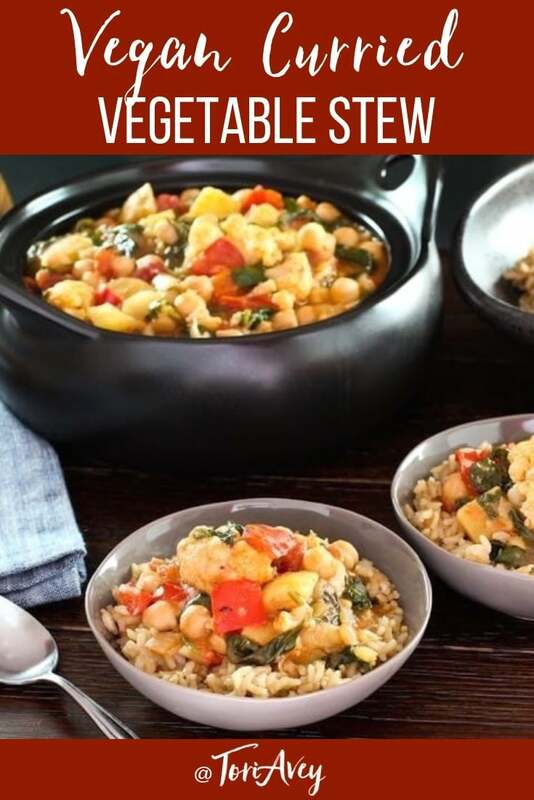 In addition to being an easy meatless meal, this stew is flavorful, wholesome and nourishing. I originally adapted the recipe from TheKitchn, and it has since become a family favorite. It has a great blend of spices and a healthy dose of vegetables in a coconut-infused broth. First I made this recipe as written, then I made some improvements in subsequent batches. The original recipe ended up with far too much liquid for our taste (more soup than stew), so I cut that down dramatically. I also used red peppers for their natural sweetness, and substituted fire roasted tomatoes to add another layer of flavor. You can make this in a slow cooker (directions below), but I usually go the stovetop route to make it a one pot meal. Serve it on its own as-is, or label it over rice, quinoa or your favorite grain. It’s a light, easy and flavorful autumn meal. 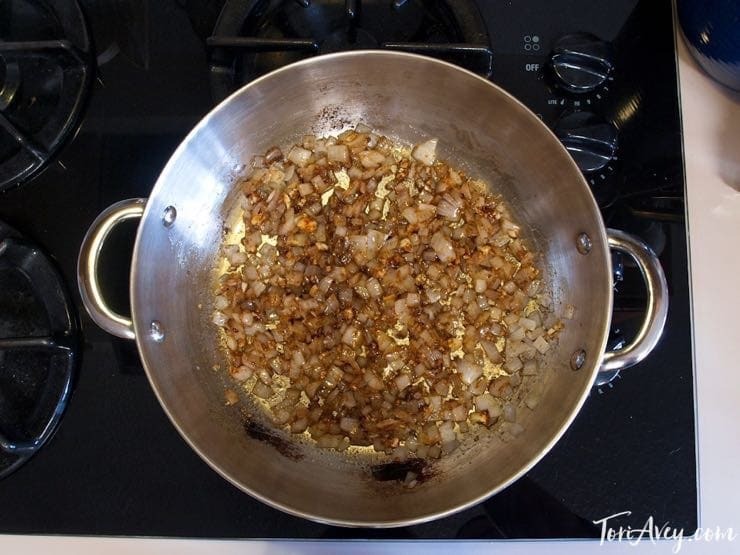 If you prefer to used cooked chickpeas instead of canned, follow my tutorial here. 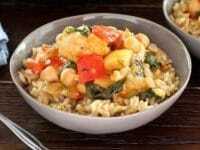 Healthy and delicious vegan, gluten free entree with cauliflower, chickpeas and greens in a creamy curry-flavored coconut sauce. Heat the oil in the bottom of a large soup pot over medium heat. Add the onion and 1 tsp of salt and sauté until translucent, about 5 minutes. Add the curry, brown sugar, ginger, garlic, black pepper and cayenne and stir until fragrant, about 30 seconds. Pour in 1/2 cup of vegetable broth and scrape up and brown bits from the bottom of the pan. 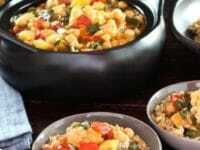 Add the potatoes, chickpeas, peppers, cauliflower, tomatoes (with the juice) and an additional 1 1/2 tsp of salt. Stir to combine and bring to a boil. Cover and simmer over for 45 - 60 minutes, stirring occasionally, until the vegetables are tender. Stir in the coconut milk. Add the baby spinach or kale and stir until the greens have wilted slightly. Add more salt and pepper to taste, if desired. Serve warm as-is or over your choice of cooked rice. Heat oil in a large skillet over medium heat. Add the onion and 1 tsp of salt and sauté until translucent, about 5 minutes. Add the potatoes and an additional tsp of salt. 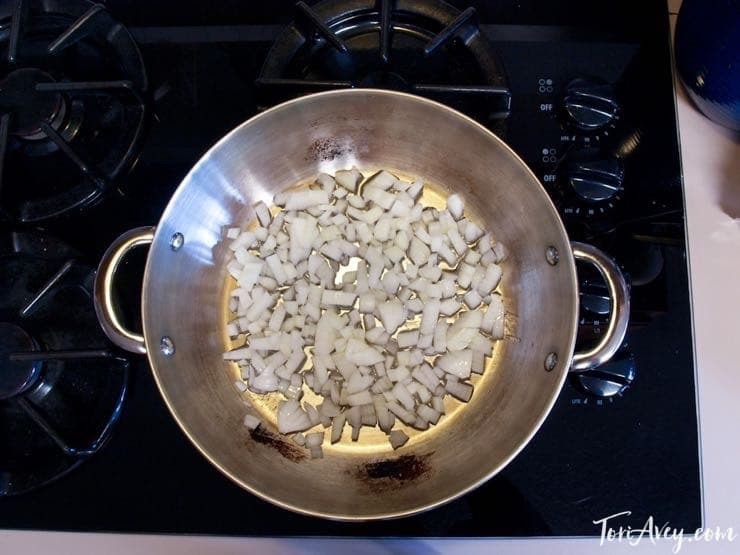 Sauté until the potatoes turn slightly translucent around the edge. Add the curry, brown sugar, ginger, garlic, black pepper and cayenne and stir until fragrant, about 30 seconds. Pour in 1/2 cup of vegetable broth and scrape up the brown bits from the bottom of the pan. Transfer the potato/onion mixture to a 6 qt (or larger) slow cooker. 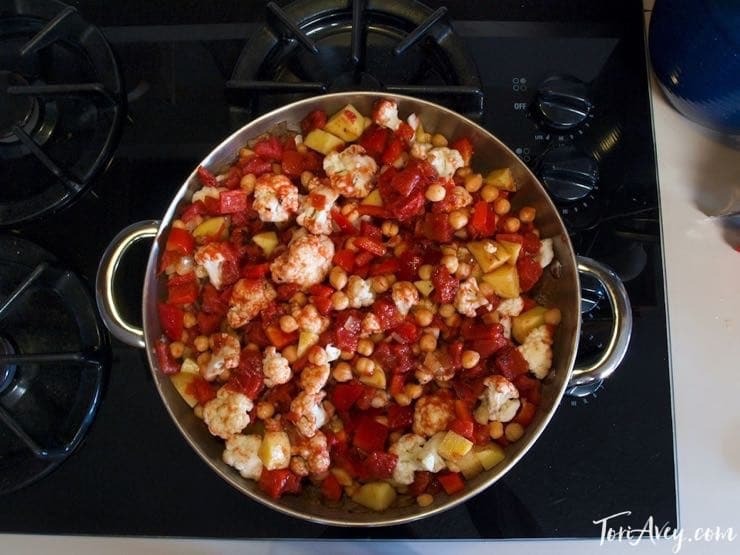 Add chickpeas, peppers, cauliflower, tomatoes (with the juice), and an additional 1 1/2 tsp salt. Stir to combine. Cover and cook for 4 hours on high heat. 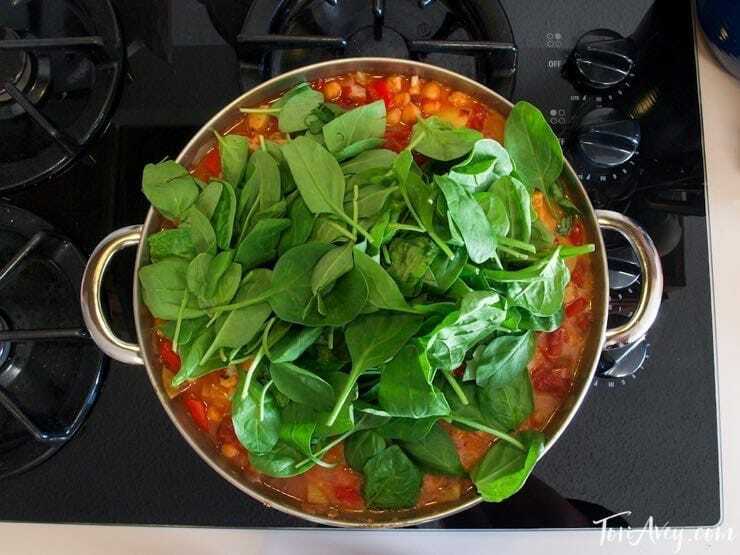 Add the coconut milk and baby spinach or kale and stir until the greens have wilted slightly. Add more salt and pepper if desired. Serve warm as-is or over your choice of cooked rice. Thanks for this great recipe! We served it on basmati rice and the kids (2, 3 and 5) loved it. It’s not always easy to serve them vegetarian dishes 😉 Plus it makes great leftovers for lunches. I made this for dinner last night and it was out of this world delicious!!! My husband said it tasted great- so fresh! And I told him, it is! !, haha! This stew is so flavorful, healthy, and beautiful. Oh yeah, cooked it in my Instapot 4 minutes on manual, a quick release, then added chopped kale and coconut milk, then served it over brown instant rice. Seriously yummy and quick. Thanks for another perfected recipe! I have to tell you, I made this delicious stew a few days ago and served it at a ladies’ dinner party I hosted last night. It was a BIG HIT! So many people asked me for the recipe! Everyone thoroughly enjoyed it, and it was healthy and easy to make. Thanks so much for this recipe, and all your recipes. I enjoy making your food and I know it will always be so delicious! I made this and adapted this to the instant pot and I must say…fabulous!! Very good, but not 272 calories per serving. Full fat Coconut milk is anywhere from 60 to 94 calories per fl oz on it’s own. That’s 810 to 1269 Calories just from the coconut milk. Assuming 810, the total calories for all the ingredients listed is around 2791. 2791 / 8 = 349 calories per serving. I used Simple Truth coconut milk. 10 calories per OZ. And added a little flower to thicken the sauce. Came out GREAT. I just plain loved it. Relatively easy to fix. Although my wife had thrown out cornstarch for Passover and didn’t tell me. So it was not a thick as I would have liked it to be. But went very well, my daughter of blessed memory would have loved it also. Toda raba. It went really good with Stonefire Naan. Made this dish for a relative visiting from Britain. She is a vegetarian. Everyone loved it. Even those who ate meat, at his as their vegetable side. Thanks for a great recipe. As a novice cook, I wanted to confirm the 1/2 cup vegetable broth in this recipe. Seems a bit scant to cover all the vegetables in the recipe. I’m making this for Passover and want to get it right. Hi Milton– yes, that is correct. The vegetables have a lot of natural liquid inside of them that will create a sauce as they cook. Made this curry today along with jasmine rice and my whole family loved it! Great vegetarian recipe for a snowy day like today. I highly recommend it. Can You Freeze It ?? Delicious! My husband even enjoyed it!! Thank you for this. What is your method for cleaning and checking cauliflower from a kashrut point of view? Amber I do not keep kosher, best to ask a kosher expert this question. What is fire roasted tomatoes? What can I substitue with if my guest is allergic to bell pepper? Can I omit the chicpeas or what can I use instead? I like curry and I think this will make a very good dish in terms of pressentation, nutrition, and taste. Thanks. Is it best to have Kosher salt on hand. I see more recipes calling for it, but I usually don’t keep it. Same measurement for table salt, you can use either. Enjoy! I just bought some curry powder, and can’t wait to try this recipe! Thank you Tori for all your delicious recipes you share! Made this today and it was so delicious. I doubled the curry and it was scrumptious! Thank you so much for this recipe, it’s a keeper! Love you, Tori. Thanks to You, i have discovered so many delicious and healthy meals that i can make.